Shirvan National Park (Azerbaijani: Şirvan Milli Parkı) — is a national park of Azerbaijan. It was established by the decree of the President of Azerbaijan Ilham Aliyev, on July 5, 2003 within the territory of Salyan Rayon administrative districts. Its surface area is 54,373.5 hectares (543.735 km2). The Shirvan National Park was established on the base of the Shirvan State Reserve founded in 1969 and neighbouring areas. 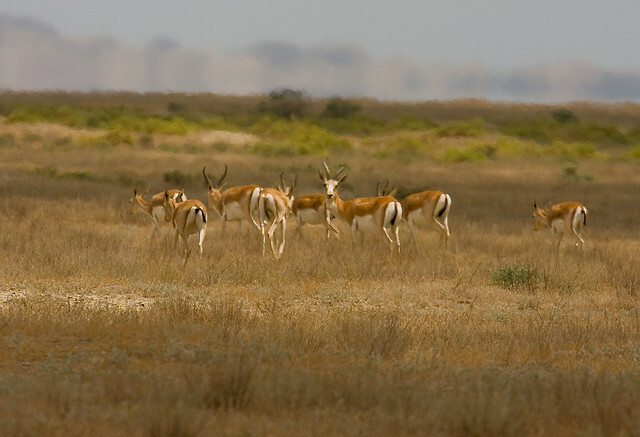 The reserve‘s activity is focused on the protection and reproduction of the Goitered Gazelle (Gazella sulgutturosa), waterfowl birds and typical plant biotypes of the Shirvan Lowland. The area is 25800 hectares, of which 3500 hectares are water reservoirs. The territory of the park used to be at the bottom of the Caspian Sea and at present it is an accumulative plain, which is 20–25 m below sea level with a slight increase in the relief westwards. In terms of climate the park lies in an area of moderate warm semi-desert and arid steppe. Summers are hot and dry and winters are cool and dry.